It’s the last day of the school holidays, Tobit has gone back to work, we are all still in our pyjamas AND the chidren are playing really nicely together upstairs. So I’m slipping in a quick blog post! 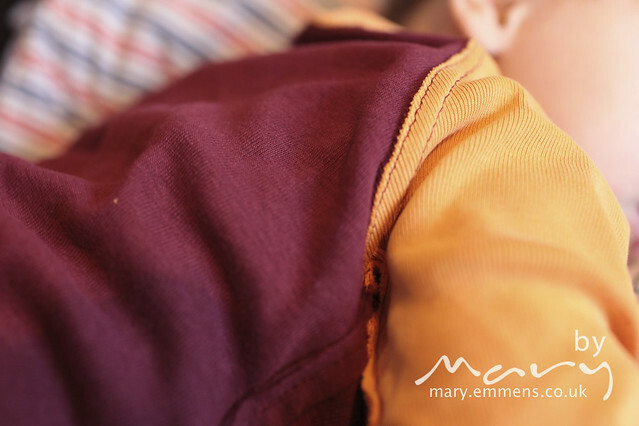 Last week I spotted something somewhere about a sew along for boys (to sew boys clothing, not for boys to sew!) 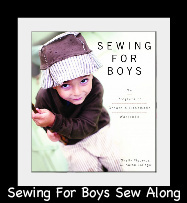 using the book Sewing for Boys. Tobit bought me the book when it came out in the UK, September I think it was. But to be honest I’d not done more than quickly flick through it as I had more pressing sewing to do. But the idea of a sew along was really quite appealing. So I had a read of the intro post on Stacey’s blog here and decided to join in. 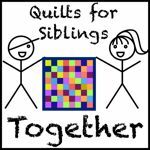 It’s a year long sew along, there are 24 projects in the book so plenty to keep me busy! For the month of January we are going to make the Raglan Tee. I’ve not sewn with knits before but have wanted to give it a try especially after reading The Fabric Selector by Dana Willard which Tobit gave me for Christmas. Ok so he doesn’t actually look that happy so you’ll have to take my word for it! The raw seams are on the outside, I did get a bit confused as I sewed as to wrong and right sides, but when I finished I decided this would be the right side, but Tobi did put it on Mathias the other way as he thought it looked neater! 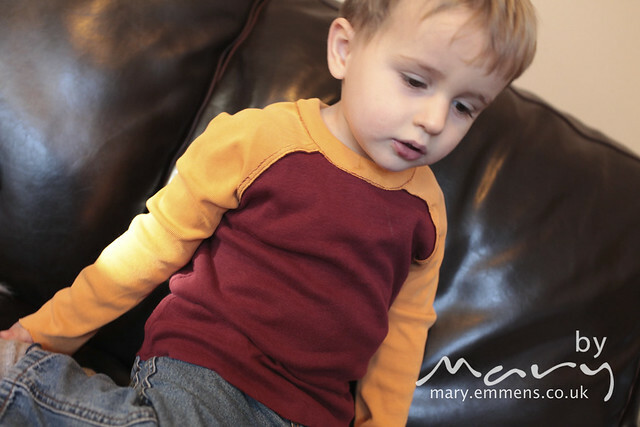 The idea is that any scratchy seams are on the outside and not on my little boys skin! And now about sewing with knits I can say ‘That wasn’t so bad!” (that will mean more to you if you’ve read the book). I now need to add something to the shirt. Well I don’t need to, but to enter it into the monthly sew along draw that is the deal, and you know how I like a bit of t-shirt applique! So leave it with me, the shirts in the washing pile at the moment, once it’s clean and dry I’ll get to work on it! A note on sizing: Mathias at 2 yrs (27 months) is small for his age (according to UK health charts) but I made a 2-3 yr size from the book and it fits fine, if anything the neck opening is a bit tight over his head. Feel inspired? There is still plenty of time to join in the fun, 360 days or so in fact! I think I might get some more sewing done today as the rain is pouring down today – there is no way we are going out in that! Have a good day whether you are back at work or still enjoying the holidays.